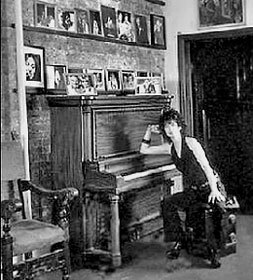 The Gene Frankel Theatre is one of most historic Off-Off-Broadway theaters in New York and we need your support. We just went through another uncomfortable and HOT summer with our actors and audience roasting. If you know this theatre, you understand. We cannot afford to be dark for three months and it affected us. I love this theatre. During the 13 years since Gene Frankel passed me the keys, my position has been one of those rare instances that allowed me to share my passion for art and theatre while working hand in hand with so many talented people. With this position I have created a safe and creative environment for artists to succeed. We received a New York Times Critics’ Pick this season and first time playwright Paul E Alexander’s Trinkets sold out. We also worked with artist Scooter LaForge and have featured artists like Hattie Hathaway, Hapi Phace, Nora Burns, Jorge Clar, Amy Lloyd, Elle Sunman and Rafael Sánchez. The Gene Frankel Theatre has remained steadfast since its namesake founded the theatre in 1949—. Our goal is to keep Gene Frankel’s legacy of sociopolitical theatre alive through classes and performances. Gene’s direction of Jean Genet’s The Blacks—The Clown Storywas praised by critics and audiences alike as one of the most important productions in U.S. theatre history and milestone in African-American theatre. The play set the tone at the GFT for years to come. Today it is more relevant and necessary than ever for this small theatre to fuel the flame that attracts these artists. We are reaching out for your donation. Please, make a 100% tax-deductible donation to our not for profit 24 Bond Arts Center. We need you because Central AC is on sale. We also need help our rears. Our goal is $50K. # If you donate $10,000 a brass plate of your name over the theatre door, a real kiss from one of our artists, tickets to a show at the Gene Frankel Theatre an original Scooter LaForge tote bag. Our Mission: The Gene Frankel Theatre has remained steadfast since Gene Frankel founded the theatre in 1949; finding and cultivating an audience that can share with us the discovery and excitement of theatre. Currently the Gene Frankel Theatre is still vibrant with classes and revolutionary theatre. Our goal is to keep the legacy of Gene Frankel alive by nurturing new talents that voice who we are today. We are looking to give a home to artists that cultivate a theater that speaks not only of an idealistic socio-political change – but a personal change, the only truly manageable change that can lead to a new and better social, political, economic world. The work that has come from this venue for the last 63 years has had civil rights and progressive thinking at its core. Entrance to the Gene Frankel Theatre with Gene Frankel’s portrait on the door. In 2007, the opening of 40 Bond Street–a luxury condo by Ian Schrager–signaled the demographic shift to come in NoHo and its surroundings. NoHo, roughly defined by the ten blocks north of Houston Street, between Broadway and Bowery, was the home of a thriving theater and music community. With the going rate of 1-bedroom apartments in NoHo at around $4000 today, it’s easy to see why there’s been difficulty sustaining some of the artistic venues in the area. The Bleecker Street and the Bouwerie Lane Theaters closed in 2010 and 2007, respectively and CBGB–a seminal establishment for the modern punk rock culture–shut its doors in 2006 after a lawsuit over outstanding rent. 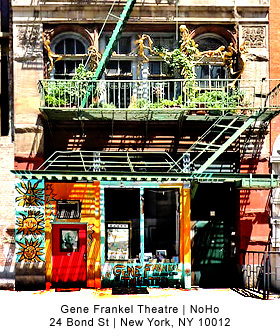 One institution that survived the rising property prices is the Gene Frankel Theatre, located at 24 Bond Street. We are looking to give a home to artists that cultivate a theater that speaks not only of an idealistic socio-political change – but a personal change, the only truly manageable change that can lead to a new and better social, political, economic world. The work that has come from this venue for the last 63 years has had civil rights and progressive thinking at its core. Today this is more relevant and necessary than ever. We are looking to reach out to our community and invite its people in their whole to celebrate new thinking, new ideas and a deeply emotional positive change. The theater hit an impasse when Gene Frankel died in 2005. The current director, Gail Thacker, took over the business and has been struggling to make ends meet. With business savvy and enthusiasm she was able to avoid bankruptcy. According to Thacker, gentrification does not only bring drawbacks like exorbitant property prices. It also brings more foot traffic to Bond Street, which is now a block well frequented by shoppers and tourists. NoHo hasn’t always been a refuge for wealthy New Yorkers, although Bond Street was initially laid out for the city’s richest who built mansions on the wide street in the early 1800s. By the 1880s and 1890s, manufacturing dominated and the Greek Revival architectural style was instituted as a nod to its illustrious past. 24 Bond Street, the building where the Gene Frankel Theater is located, was constructed in 1893. NoHo was designated a historic district in 1999. At the time, the facade sculptures on the Gene Frankel Theater by Bruce Williams were deemed illegal, but after a public hearing the Landmarks Preservation Commission ruled in favor of keeping the art. 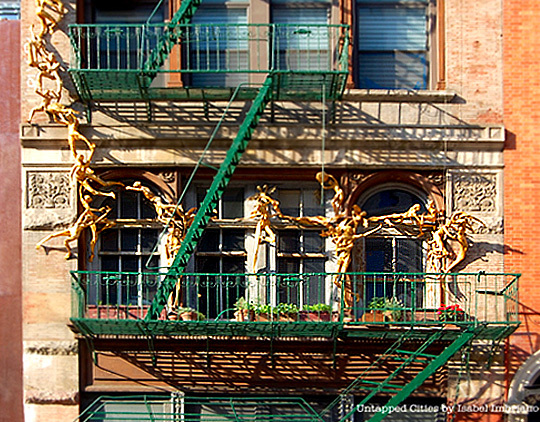 The front of the building with statues sculpted by the artist ►Bruce Williams.